Compiled here are annotated links to resources and references to the movie / video mode on the Canon 7D, and sample footage, movies and video clips. Just something to ponder on, would you shoot stills, or a video of a lifetime sequence of events that unfolds right in front of you? Hybrid wedding or event photographers or videographers might want to glean some ideas from Photo Fusion: A Wedding Photographers Guide to Mixing Digital Photography and Video. Aspect ratio: 16:9 in HD (high definition), or 4:3 in SD (standard definition). 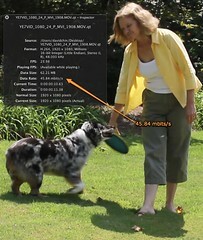 Video and file format: Quicktime .MOV files, H.264 / MPEG-4 AVC video compression. Movie clip length: 4GB per clip or a maximum continuous movie capture time of 29 minutes and 59 seconds, whichever comes first. 4GB equates to about 12 minutes of Full 1080p HD at 30 / 25 / 24 fps or 720p video at 60 / 50 fps (5.5 MB/sec) or 24 minutes in VGA / SD mode at 60 / 50 fps (2.8 MB/sec). Audio: CD-grade, 16-bit linear PCM at 48khz without compression. The sound is recorded in stereo if you plug in an external stereo microphone into the 3.5mm stereo mic jack. The built-in microphone is a convenience that allows for monaural / mono audio recording. Mic levels and wind noise suppression are adjusted automatically with no provision for manual override. Autofocus: Contrast-detect AF is available during recording, but will not be quick enough for practical subject tracking. It’s still better than not having any AF at all, and you still have the option of manual AF. AF is triggered by half-pressing the shutter button, or pressing the AF-ON button. Manual settings: To manually adjust the shutter speed, aperture and ISO / sensitivity, put the camera in M (Manual) mode first. Exposure is determined automatically in all other modes. 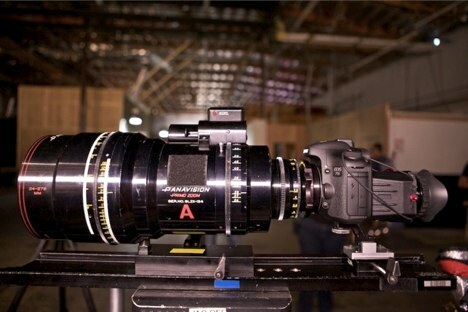 philipbloom.co.uk has a nice photo of a Canon 7D fitted with an enormous Panavision cinema lens. prolost.com has an excellent essay on the 7D’s movie mode. Refer to DPReview for a couple of screen captures of the movie mode settings. 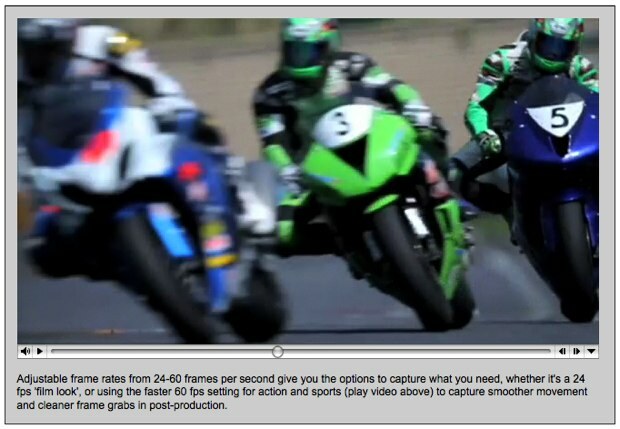 The Canon Digital Learning Center has a great article titled Harnessing the Power of the EOS 7D’s Video System that has some tips on depth of field control and choosing the appropriate video frame capture rate and exposure settings. Lightning strikes three of the tallest buildings in Chicago at the same time — Craig Shimala edited the video with Sony Vegas Movie Studio. Canon’s official EOS 7D movie, ‘The Passage’ (I love Venice), can be viewed at a high 1024 x 576 resolution at cweb.canon.jp (the version at web.canon.jp only goes to 960 x 540). Be sure to select the correct DSLR model and appropriate options once you’re at the site. 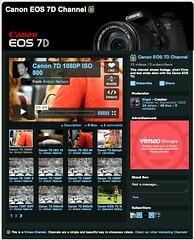 Here are some EOS 7D movie clips on YouTube. 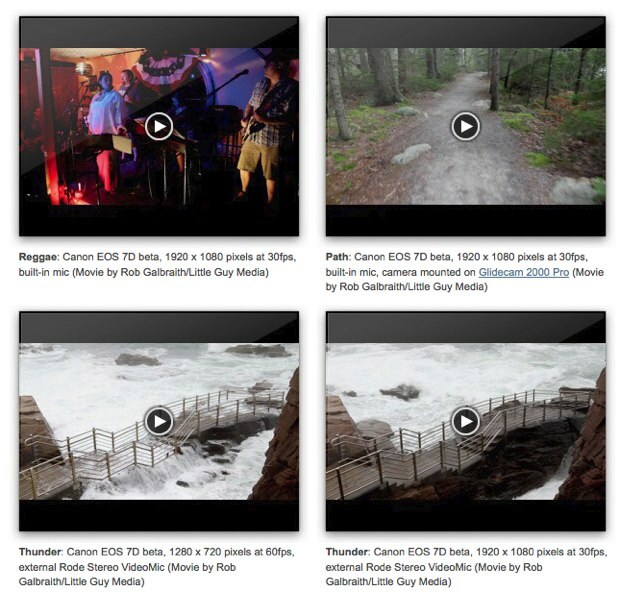 Next up, we have sample clips on Vimeo. For best viewing results, make sure you turn on the HD option, which appears whenever you hover your mouse over the video. If the clip owner allowed it, you will be able to download the original file, but you’d first need to create a free login. You might want to consider subscribing to the Canon EOS 7D Group and Canon EOS 7D Channel on Vimeo to be on top of the latest and greatest footage as they’re uploaded by members. More sample 7D video clips (which have been “trimmed for length but are otherwise unedited”) can be downloaded at robgalbraith.com. Imaging Resource has the most comprehensive article on the 7D’s movie / video capability, in addition to providing a ton of samples. Playing back some of the clips reveals the data rate of the 7D videos. 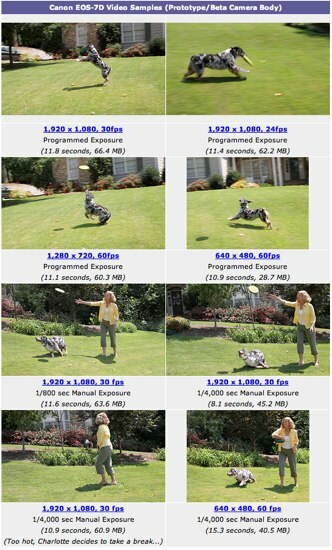 In the screen captures below (click to view the larger version), it’s 22.2 mbits/s for SD / 480p, and 45.85 mbits/s for HD / 1080p. 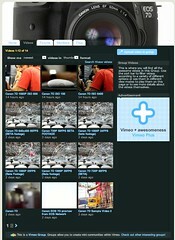 DP review has a lengthy preview of the camera posted on its site. Contained within the preview is a clean unmodified, non-compressed, straight out of the camera, 1080p / full HD H.264 mov file which you can download. 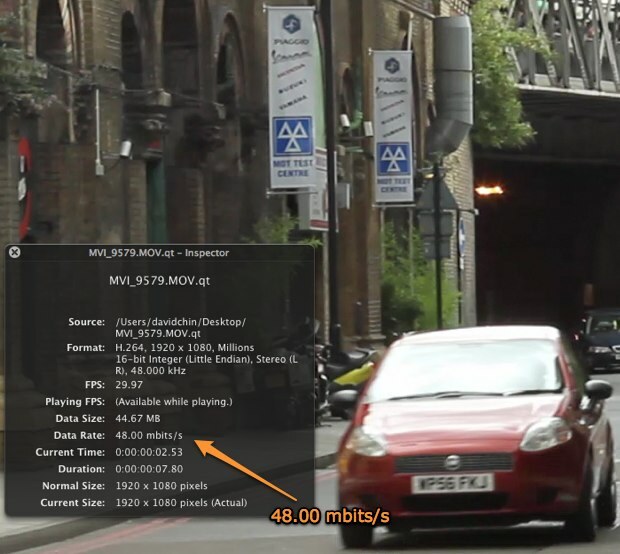 The screen capture shows the bitrate to be 48.00 mbits/s.